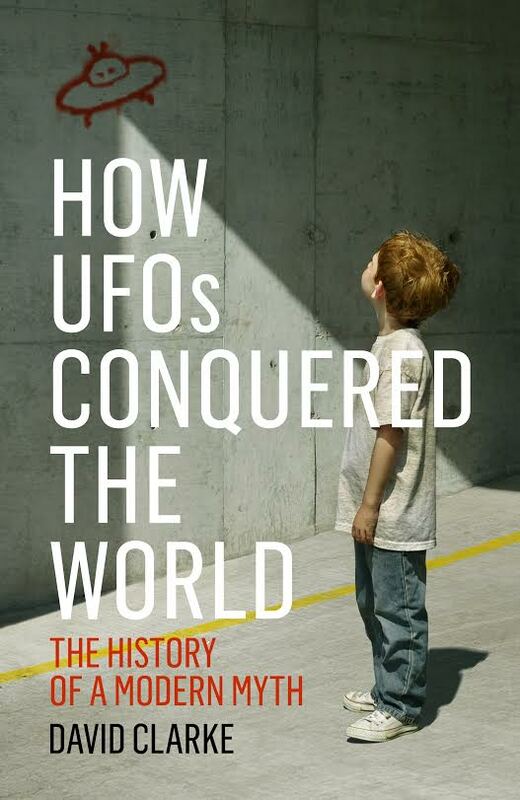 How UFOs Conquered the World: The History of a Modern Myth, will be published in hardback by Aurum Press on 14 May 2015. It is the story of the long, strange trip that I began almost forty years ago when I was first gripped by the UFO bug as a child. Partly a personal pilgrimage and mostly a social history it is a nostalgic top-down deconstruction of a subject that never ceases to baffle, infuriate and amuse in equal measure. The young lad on the cover is meant to be my ten-year-old self about to set off on a series of strange adventures in the wacky world of ufology. The UFO was born in America during the summer of 1947. A lone pilot saw nine mysterious objects that flew ‘like a saucer would if you skipped it across water’ and the media did the rest. Today, almost half the population of the Western world believe we are not alone. Millions of people claim to have seen a UFO. An alarming number reported being ‘abducted’ by aliens. And some are convinced there is a conspiracy by governments to hide ‘the truth’. As a child during the 1970s, David Clarke wanted to believe. He joined a UFO society, went ‘skywatching’, and later, as a journalist, spent decades investigating sighting reports, unearthing Top Secret government files, and interviewing those who claim they have seen interplanetary craft and had met their occupants. He never found a crashed flying saucer, or received a visit from the sinister Men In Black. Instead he discovered something no less astonishing. This book describes David’s strange journey to the heart of the UFO phenomenon. He has close encounters with abductees, hoaxers and conspiracy theorists. He meets people who think aliens are angels (or demons). And he tracks down the boffins who ran the British government’s now defunct ‘UFO desk’ to find out what their investigations really uncovered. Along the way he reveals how the human will to believe turned the stuff of science fiction into the most enduring myth of modern times. This entry was posted in Uncategorized and tagged alien abductions, Aurum Press, close encounters, flying saucers, How UFOs Conquered the World, Kenneth Arnold, Men in Black, Ministry of Defence, myth, UFO desk, UFOs. Bookmark the permalink. Mr Clark I will read this book with interest, my stories is much the same as yours except for all the people you have interviewed. Like you I have arrived a long time ago at the same conclusions that you have. Thank you for this book and the honest research I know you have concluded. I sincerley hope it is read by all,sceptics and also believers. I have read your articles in the past and rank you as an honest, trustworthy down to earth guy only speaking the truth. I am now 69 years I no longer look at anomalies in our sky’s and wonder just what they are. I now wonder just how many black apps craft exists and just how old they must be. I do wonder if there is a whole scenario out that we do not know about concerning these craft, and just how lo g it has been going on for, and what the outcome if any, will be. People have been seeing ‘UFO’s’ for thousands of years; how does that make it a modern myth? A myth is “a traditional narrative sometimes popularly regarded as historical but not authenticated.” Of course people have been seeing things in the sky for centuries. In the past people thought they were gods, demons, angels, etc. But the ‘modern myth’ is the idea that UFOs are flying saucers, i.e. craft from other worlds, i.e. a story that millions believe but is not authenticated, e.g. a myth. I understand what a myth is thank you very much. However, in the above blurb for your book you state that you meet with people that claim (still) that they think ‘UFO’s’ are angles, demons etc. so is it that this ‘myth’ has persisted unchanged but with a new wrinkle of technology added? When Alexander the Greats historians described glowing shields that appear in the sky, that to me sounds like flying saucers. I don’t know that I see a significant difference between that ancient description and Kenneth Arnold’s description. Are you addressing the conflict between what were called ‘gods’ not of this earth and non ‘gods’ not of this earth such as the so called greys? The problem is that Kenneth Arnold did not report ‘flying saucers’. He described batwing shaped objects that moved like a saucer would if you flipped it across a pond. The media created ‘flying saucers’ and then people went on to actually see them. So the argument that people have always seen flying saucers, before the media created the current myth, does not stand up to even the most basic scrutiny. It makes no sense to argue that Alexander the Great really saw flying saucers, not glowing shields. If we could bring him back Alexander might equally argue that Kenneth Arnold did not see flying saucers either (even though he never said they were saucers); he might say people in 1947 were really seeing glowing sheilds. Whose myth is the most important? Why should our modern ideas be imposed upon previous generations? I was a believer when young, but it wasn’t until I was probably in my 30s that I really looked into flying saucers seriously, and then found out that Arnold never even said he saw flying saucers…IIRC he said the objects behaved like they were skimming across a lake, as would a saucer or stone correctly propelled…but isn’t this the way of much of the subject, folks misrepresenting what is said or observed? I’ve been on forums in the past where folks are 100% sure of alien piloted flying saucers, yet openly admit they have no evidence other than reading other peoples anecdotes, or looking at dodgy photos. People will see what they want to see, I think…I remember a few years ago some guy in Canada trying to sell for $30,000 Canadian, a picture of a flying saucer, that was obviously -to me and others- just an out of focus bird; you could even make out its beak!!! IVR, of course Flying Saucers are a modern myth, the Virmana et al from the past may, perhaps, be considered Unidentified Flying Objects, but not Flying Saucers -a term coined in modern times. I find it very interesting that Arnold never called them saucers, yet once in the consciousness of humanity, thousands of people and thousands of sightings have seen ‘Flying Saucers’. Similar to the the ‘Flying Triangles’ also reported, once in the consciousness, people started reporting them. Who knows what Arnold actually saw, I’d have found the whole phenomena more intriguing if all subsequent sightings were of the crescent/bat wing shaped craft Arnold clearly described. Instead we have a vast variety of different types of ‘Flying Saucers’ reported -which I believe is a clue that they are an invention of minds trying to make sense of something they have no reference for comparison -if not just a good old-fashioned hoax. There does seem phenomena that are not everyday and seem to confuse and baffle many folks today, until I witness one I can’t say what these folks have seen, and in truth every sighting is a unique observation event -even IF one Flying Saucer sighting was proven to be an alien piloted vehicle, it doesn’t mean even one other of the many thousands were, are or will be. I was a believer in my youth, I looked at photographs and wondered what the pilot looked like in the craft, then when I started really looking into it, I realized there is no evidence for alien piloted vehicles, for me it is telling that with a probable one billion plus cameras on the planet, and many of them with their owners 24/7, and yet we do not have ONE incontrovertible Flying Saucer photo…people want to believe too much…their rationality has been suspended. First of all, “…with a probable one billion plus cameras on the planet, and many of them with their owners 24/7, and yet we do not have ONE incontrovertible Flying Saucer photo.” How could a photo ever prove that? By whose standard? Do you know what one looks like? What is a flying a flying saucer? An ET spaceship? A piece of dishware? Your statement is meaningless as it sets a bar that is neither high nor low, but floating in some vague nebulous cloud devoid of meaning or direction. What I THINK you mean is that ‘flying saucer’ is a modern term and that no one has sufficiently proven to you that there is photographic evidence that demonstrates that an unidentified flying craft is from another planet or dimension or whatever. There are sightings of objects in the sky, and water, that don’t lend themselves to any obvious explanation; They are literally unidentifiable objects. If they are from another realm (planet, time, dimension or whatever) the only way we will know this, is if they tell us. To my knowledge this has not happened. Or, they are secret military craft utilizing a technology that has not hit the mainstream yet. There a number of problems with this scenario that I won’t go into now. Another possible explanation is that they are manifestations of our collective consciousness that are somehow imprinting images on to film or what not. That seems unlikely for a number of reasons as well. In the end what this phenomenon is, are those 5-10% of all objects scene through out history that defy a reasonable explanation. Call them what you will, as the name is just a reference point. I have had an interest in UFOs for most of my adult life and have read many books about UFOs, mainly supporting the ET hypothesis. Two books in particular—Witness to Roswell and Children of Roswell, written by Thomas J. Cary and Donald R. Schmitt—was convincing proof, at least for me, that UFO sightings (or at least some of them) were extraterrestrial. Then I read a short piece in Scientific American that debunked the whole idea of the ET hypothesis. In the notes to the article was a reference to David Clarke’s book How UFOs Conquered the World. This book pretty much changed my viewpoint about UFOs, namely that they are not space craft of an extraterrestrial civilization. There is just one event (or non-event) that I would like to see an explanation for: Roswell. The authors of the two books mentioned above interviewed more than 200 witnesses to events that happened during the first 2 weeks of July 1947. If the ET hypothesis is false—which I believe it is– then there can be only a few explanations: The witnesses only imagined what they claim they saw, or hallucinated or were insane. Or, all the authors of all the many Roswell books were all lying about an event that never occurred. Does anyone have an ideas about this? It isn’t the case that there ‘can be only a few explanations’. We are dealing with human beings and there are many motivations for perpetuating fake news. Walter Haut was a very old man when he was ‘persuaded’ to make his statement by the authors of Witness to Roswell. If you do some searching on the circumstances you will find the affadavit, as evidence, isn’t worth the paper it’s written on. If the Roswell incident never happened, for what reason would the authors of Witness to Roswell want Walter Haut to sign an affidavit about an incident that never occurred? Who started the “myth” of Roswell in the first place? Don, your questions should be directed at those who created and sustained the Roswell myth. Have you read the book Area 51: An Uncensored History of America’s Top Secret Military Base? According to the author, the flying discs that crashed in New Mexico in 1947 were Russian: “…inside the disc, there was a very earthly hallmark: Russian writing, Block letters from the Cyrillic alphabet had been stamped, or embossed, in a ring running around the inside of the craft.” (page 37) The remains of the craft were recovered by Army personnel and shipped to Wright air base (Wright Patterson Air Force Base, as it is known today). Since there were no interviews of any of the witnesses to this event until about,30 years later, this could explain the misinterpretation of the witnesses as to what they believed they saw, misinterpretations that could have been one of the causes of the UFO phenomenon.